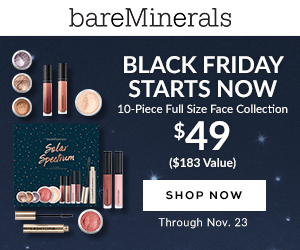 bareMinerals Black Friday Deal Available NOW!!! BLACK FRIDAY EXCLUSIVE: Solar Spectrum 10-piece full-size face collection for only $49. A $183 value. While supplies last. Valid 11/22-11/23 at bareMinerals.com.